Pininfarina has presented a first teaser image of its concept car for this year's Geneva Motor Show, a luxury and environmentally-friendly sports sedan, which will be unveiled on March 6 at the Palexpo. Pininfarina has presented a first teaser image of its concept car for this year's Geneva Motor Show, a luxurious and environmentally-friendly sports sedan, which will be unveiled on March 6 at the Swiss Palexpo. Dubbed Cambiano, Pininfarina says that "it is an elegant and refined sport sedan, conceived with great attention to the environment, both as to the engine and as to the materials' choice." The eye-catching new concept will be a welcome visual shot in the arm for Pininfarina which continues to shrink in size and lose money according to its most recent financial report issued on November 14, 2011. Shorn of much of its traditional operations, last year it lost its interest in the Pincar electric vehicle project while somewhat optimistic hopes that Gian Mario Rossignolo's plans to revive the De Tomaso brand which would have provided employment for staff as well as design and engineering work appear to have fizzled out. According to Pininfarina: "Cambiano represents the summit of Pininfarina skills in terms of styling and engineering." 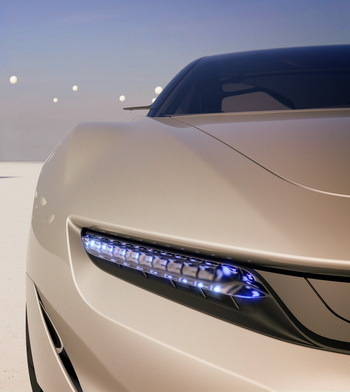 It isn't clear why Pininfarina has chosen the route of a luxury sedan as its showcase concept for the 2012 Geneva Motor Show, however it could be that this concept is actually the 'sedan' offering from the stillborn De Tomaso project and given a quick makeover as well as Pininfarina badges. The new concept has however been named after the Italian City of Cambiano next to Turin which is long time home to the headquarters of the Pininfarina Group, and in particular chosen as the title to celebrate an important double anniversary this year: 30 years of the Pininfarina Styling Centre whose operations got underway in Cambiano in 1982 (at the beginning it was known as the “Pininfarina Studi e Ricerche/Pininfarina Study and Research” centre) and also ten years of the Pininfarina Engineering Centre, which was inaugurated in 2002 with the aim of adding to the firm's existing styling and development/niche production activities, with the wider offer of engineering services for other companies and carmakers. Pininfarina says that it will unveil further images of the Cambiano concept on its Facebook page "in the next few days" as the final two month countdown to its world première in Geneva gets underway.